Our engineers are ready to work with you to help achieving your goals. The company, thanks to its professionals’ expertise on most engineering disciplines and applications, has a long-lasting reputation for solving the most complex and challenging problems that industry may present. Our experience on thousands of successful projects can help you meet your goals. We make the success of our customers our priority and we try hard our best to provide you with top notch services. Whether you need an additional resource or need support developing new processes and capabilities, you can count on us. Our experience on a multitude of succesful projects (analysis & simulation) will help you achieving your targets. Our company portfolio is extremely large. A team of professionals and experts carefully manages customer’s requirements ensuring a specialized type of counseling. The services offered are in continuous expansion and continuous improvement, with the objective of providing Customers the certainty of the highest quality, cutting-edge solutions and a time-cost ratio in line with the market needs. We avail of a highly qualified labor force. Whether you need help with analysis capability growth, training & mentoring, on-site short-term staff shortage, technology transfer or root-cause investigation, our engineers are ready to work with you to help achieving your goals. We will work to understand your problems and assess how we can help you along the process of achieving your objectives. Our focus will be on your needs and available resources. We treat our clients as partners and will therefore involve you in all aspects of your project. By working in such a synergy and developing a strong relationship, we will also share our know-how with you. CFD Engineering works in close contact with other specialists to ensure low-risk and low-life cycle cost solutions for complex engineering problems. CFD Engineering is uniquely qualified to provide CFD analysis services for an entire scope of fluid flow and related problems. Simple or complex geometries can be studied with a steady-state or transient analysis. Incompressible or compressible flows with or without the effects of viscosity can be readily analyzed, including the effects of heat transfer and convection. Rotating and translating components can also be effectively modeled and analyzed. Axial and centrifugal pumps, of aspiration pumps, ecc. 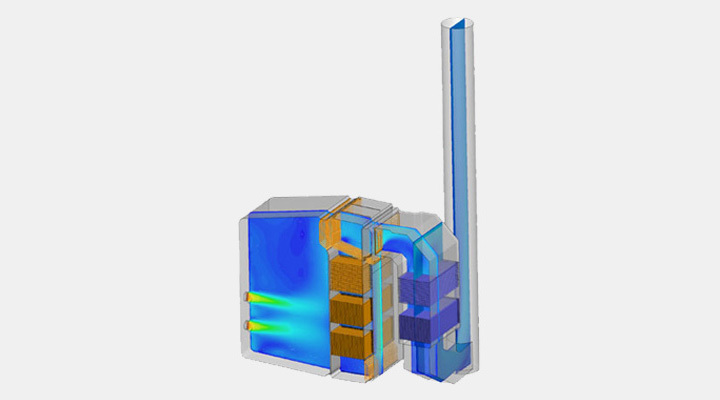 ANSYS FLUENT™ is a software able to perform thermo-fluidynamic simulations for engineering applications. It is based on cutting-edge physical models and includes an accurate and robust solver. It enables the modeling of turbulence, thermal exchange, reactive fluxes, phase changes, aeroacoustics and the great part of phenomena governing industrial applications. Its usage capabilities are enlarged by the possibility of using moving and deforming meshes and of implementing user-defined-functions for inserting new models and modifying the old ones. It is compatible with the greatest amount of meshing software available in the market, the user being completely free of choosing tools best fitted to his demands. ANSYS FLUENT™ includes a post-processing environment entirely integrated in the graphic interface allowing an immediate and simple visualization of results. NUMECA International offers a complete spectrum of softwares focused on turbomachinery fluidynamic simulation. It is based on FINE™ (Flow Integrated Environments), which joins CAD modelling capabilities, pre- and post-processing tools and a density-based multi-block structured RANS solver. The included mesh generator, AutoGrid™, enables the construction of fully hexahedral meshes on rotating machines. The main advantages of this software are: the semi-automatic generation of control volumes starting from the blade profile CAD drawings; the capability of inserting geometrical details (fillet, leakage, cavities, ecc. ); the semi-automatic treatment of film-cooling holes; the possibility of manually building specific gemoetries by means of IGG™ tool. Euranus™ solver uses a 3D RANS approach: it is able to deal with complex geometries, guaranteing the maximum flexibility in treating multi-block meshes. It is provided with a parallelizing tool which distributes load on different processors in a completely automatic way. CFView™ visualization tool represents a platform for the 2D and 3D post-processing; it supports the use of scripts for parametric visualizations and specific features for turbomachines such as meridional and blade-to-blade views. 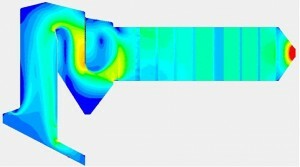 Among its main applications CFD Progetti is involved into we cite external aerodynamics evaluation on turbine blades, conjugate computations for cooling system verification, multi-stage computations. OpenFOAM™ (Open Field Operation And Manipulation) is a collection of C++ libraries devoted to the numerical simulation of physical phenomena regarding the continuum mechanics. Among its main applications, we cite: reactive fluidynamics of complex flows, turbulent flows with heat transfer, conjugate computations, solid mechanics. The code is provided with a lot of pre-configured solvers and utilities which can be used as any other commercial tool for the numerical simulation. But in addition with respect to commercial softwares, OpenFOAM™ is open and free: the code is completely open and can be modified without any restriction only depending on user demands. ANSA is an advanced pre-processing multi-disciplinary CAE tool provided with all the features needed for creating a complete model, from CAD drawings until the creation of the input file to be passed to the solver. CAD geometry can be read in a neutral format and quickly and simply modified. The software is also provided with the best and cutting-edge tools and algorithms for the generation of both surface and volume meshes, with the most important quality controls, and with the possibility of generating tetrahedral, hexahedral and polyhedral mesh elements. The flexibility of the software is also guaranteed by the features it provides for exporting mesh files directly in the format required by the desired solver: library of available software formats is very large. DAKOTA (Design Analysis Kit for Optimization and Terascale Applications) is a toolkit providing a flexible and extensible interface between analysis codes and iteration methods. It contains algorithms for optimization with gradient and nongradient-based methods, uncertainty quantification with sampling, reliability, stochastic expansion, and interval estimation methods, parameter estimation with nonlinear least squares methods, and sensitivity / variance analysis with design of experiments and parameter study capabilities. These capabilities may be used on their own or as components within advanced algorithms such as surrogate-based optimization, mixed integer nonlinear programming, mixed aleatory-epistemic uncertainty quantification, or optimization under uncertainty. By employing object-oriented design to implement abstractions of the key components required for iterative systems analyses, the DAKOTA toolkit provides a flexible problem-solving environment for design and performance analysis of computational models on high performance computers. 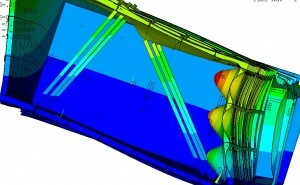 CFD Engineering offers a complete range of structural analysis services by Finite Element Analysis (FEA) consulting services including all types of static analysis & dynamic analysis, linear analysis & nonlinear analysis along with coupled field analysis, thermal analysis, and fatigue analysis services. Our FEA services help you address a range of structural and thermal analysis challenges with accurate, timely and cost-effective solutions. From basic component analysis to complete push-button FEA processes, we deliver reliable solutions that provide real benefit. CFD Engineering professionals have advanced degrees and deep experience across industries including aerospace, civil-structural, power generation, oil and gas and consumer products. Our engineering analysis expertise helps our client’s improve their products from an early design stage often reducing time to market and cutting production costs. NASTRAN is a finite element analysis (FEA) program that was originally developed for NASA in the late 1960s under United States government funding for the Aerospace industry. 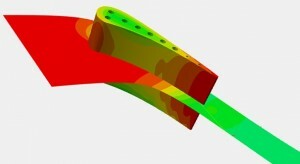 NASTRAN is primarily a solver forfinite element analysis. It does not have functionality that allows for graphically building a model or meshing. All input and output to the program is in the form of text files. However, multiple software vendors market pre- and post-processors designed to simplify building a finite element model and analyzing the results. These software tools include functionality to import and simplify CAD geometry, mesh with finite elements and apply loads and restraints. The tools allow the user to submit an analysis to NASTRAN, and import the results and show them graphically. In addition to pre- and post-processing capabilities, several Nastran vendors have integrated more advanced nonlinear capabilities into their Nastran products. CalculiX is a package designed to solve field problems. The method used is the finite element method.With CalculiX Finite Element Models can be build, calculated and post-processed. The pre- and post-processor is an interactive 3D-tool using the openGL API. The solver is able to do linear and non-linear calculations. Static, dynamic and thermal solutions are available. Both programs can be used independently. Because the solver makes use of the abaqus input format it is possible to use commercial pre-processors as well. In turn the pre-processor is able to write mesh related data for nastran, abaqus, ansys, code-aster and for the free-cfd codes dolfyn, duns, ISAAC and OpenFOAM. A simple step reader is included. In addition external CAD interfaces like vda_to_fbd are available. The program is designed to run on Unix platforms like Linux and Irix computers but also on MS-Windows. The CalculiX package was developed by a team of enthusiasts in their raw spare time. They are employees of MTU Aero Engines in Munich, Germany which granted the publication. CFD Engineering integrates its ability to run numerical simulations for specific components (CFD and FEA), with the design, calculation and analysis of heavy duty gas turbines for power generation. The activities are conducted through the application of specific numerical tools independently and self-developed and based on internal project procedures. A special focus is on the progressive reverse engineering and design of the major gas turbine components (compressor, combustion chamber, turbine, rotating cavities, secondary air system components) with respect to the highest efficiency, availability and operational reliability. Simulink® is a block diagram environment for multidomain simulation and Model-Based Design. It supports simulation, automatic code generation, and continuous test and verification of embedded systems. SiSimulink provides a graphical editor, customizable block libraries, and solvers for modeling and simulating dynamic systems. It is integrated with MATLAB®, enabling you to incorporate MATLAB algorithms into models and export simulation results to MATLAB for further analysis.